A party is a great chance for friends and family to get together and relax or celebrate. When the summer rolls around, it is the perfect time to throw an outdoor party with a patriotic theme. Here are a few tips for throwing the perfect patriotic party this year! When it comes to throwing the perfect patriotic party, the menu is the most important element. Since most patriotic parties are outdoor affairs, grilling is the go-to for the meal. Aside from grilling delicious ribs, burgers, or hot dogs, the sides are a way to add some patriotic colors such as fruit salad or Jell-O in patriotic colors. A great idea for the menu is to color coordinate with red, white, and blue as much as possible from the drinks to the desserts. From a special blueberry cobbler with red ice cream to drinks of blue and red sodas, there are lots of ways to bring patriotic colors to the mix. When planning a patriotic cookout or party, chances are it will be outside during warmer months of the year. While being outside is fun and charming, the heat can quickly make things sweaty and unpleasant. Make sure if you are doing an outdoor patriotic party, you are doing it during cooler times of the day such as after the main peak of the sun. Avoid the time period of noon to 2 p.m. which is the hottest and sunniest time of the day. Opt instead for a late afternoon or early evening party. If you are throwing the party in the daytime when the sun is still out, make sure you have areas of covered shaded for people to cool off as well as fans. For night parties, make sure you provide a way to stay bug-free such as mosquito repellant. When throwing the perfect patriotic party, the decor is one of the easiest ways to set the theme. From red, white, and blue lanterns to balloons with flags on them, there is no better way to make it clear the party is a patriotic one than with the decor. A good tip is to add in red, white, and blue wherever you can from the napkins and cutlery to the tablecloths and plates. Make sure your theme is evident from the start with a patriotic or flag themed invitation. You can even ask guests to wear their best American flag shirts to complete the theme overall! At any themed party, the party favors are always a nice finishing touch your guests are sure to remember. The options are endless for party favors for a patriotic theme. 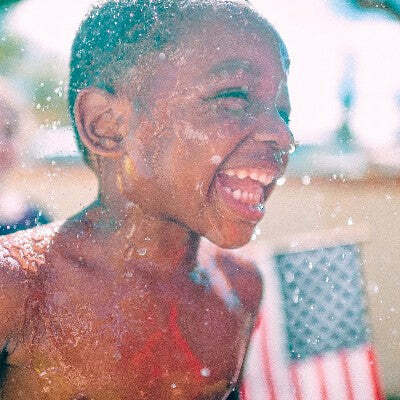 From flag shirts or hats for larger party gifts to beach towels, socks, pens, or beach balls, there are plenty of fun and functional items for a patriotic themed goody bag.